I have often commented on how breakfast in China is a still evolving skill, particularly with regard to bacon which seems boiled and rubbery. This picture may explain part of the problem. 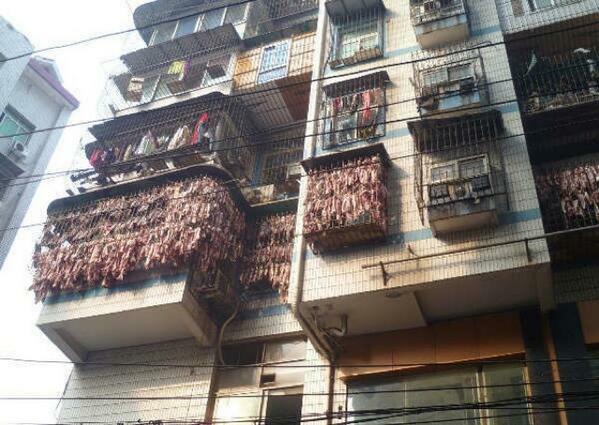 The image is from Wuhan and shows how Chinese bacon is “air-cured” on balconies in major cities. Given the alarming levels of pollution, the image is doubly unappealing. This makes the sale of fake eggs more appealing than the authentic bacon. Chinese bacon is hung outside in the winter in January. Even if you want the Chinese bacon, you may still want to pass on any dishes with bacon and boy eggs. just to keep it even, the next time i see someone airing out their bacon on a balcony i’ll laugh at them too. although around here all they’d be doing is feeding the seagulls. hey, the pollution keeps the bug population down. the birds too, apparently. I have noticed that whenever China or Russia are mentioned (ever)in our public discourse, it has to do with something that ends up ridiculing these people. It’s pretty amazing that we rarely notice that. These are Fabulous civilizations, I can’t imagine that anything that comes from there is ridicule.I bet you wonderful things are happening right now at so many street corners! Just a thought from our great, eternally and naturally open minded America. Preserved Chinese pork (sliced bacon) stir fried with garlic greens. Yum! Best I’ve had is at the Di Shui Dong restaurant in Shanghai. A month ago, in fact. RWL, I was just riffing on the Pork Producers of America motto they tried to sell for decades. They finally gave up on it. I can remember seeing pigs drying in shop windows in Madrid, but they did not have the pollution issues that China has. Just one more reason to avoid any product from China. Not always easy to do, but it could be worth the effort. RWL, Bacon is pork, “The other white meat.” The famous hams from Parma in Italy are also air dried. However, it is a MUCH different environment. Air drying for a long time creates the best cured taste and texture. Red meat consist of beef, pork, and lamb. I do not eat any of the three. Beef or calf liver is known to be one of the most concentrated sources of nutrition available. The liver, though, may concentrate chemicals and other pollutants as well, since it handles much of the body’s detoxification in humans and animals. Liver is fairly low in fat and high in protein. It is very high in pre-formed vitamin A?eight ounces of liver have 100,000 IUs, which may cause some side effects, though this is rare with infrequent intake. The vitamin By level is also the highest of any food. Other B vitamins, such as riboflavin (B2), niacin (B3), pyridoxine (B6), biotin, and colic acid, are also high. Many of the minerals are very good, too, such as iron, zinc, copper, chromium, selenium, potassium, phosphorus, and sodium. Liver is often suggested as a medicinal food for anemia or fatigue because of its high iron and blood-building nutrients. Other organs, such as tongue, heart, brains, and kidneys, are occasionally consumed by people with a taste for those things. These organs usually have a higher vitamin and mineral content than do the muscles, but they are not nearly as concentrated as liver. Another red meat consumed fairly commonly, especially in the Middle Eastern countries, lamb is similar to beef in its nutrient makeup and high protein content, and is said biblically to be the closest to human flesh. Its fat content is about midway between that of the richer and the leaner cuts of beef. Pork comes from pigs and is eaten by many cultures since the first fragrant burnings of pigs caught in the barn fire. Pig muscles?that is, pork?are similar to beef and lamb in their content of protein, fat and other nutrients. However, the cured pork products, such as ham and bacon, have very high sodium levels and contain other additives, making them foods to be avoided. Also, pork may more easily become infected with bacteria and parasites. It should be refrigerated at all times until it is cooked very well before being eaten. In general, all meats need to be refrigerated and cooked. The high amount of fats can rapidly lead to spoilage at room temperature. Steak tartare (raw), as served in some restaurants, should be very fresh. Uncooked meat should not even sit in the refrigerator for more than two Day s. It is best frozen until ready for use. The meats can be used in a variety of ways?roasted, baked, fried, broiled, made into stews with vegetables, in soups, and to flavor broth and sauces. There are many kinds of meat dishes, and different cultures use meats differently. In Western countries, large pieces of meat are eaten as the main part of a meal, while in Asian cultures, most meals contain some meat, but in a small portion compared to the vegetables and rice. Meat foods are really not meant to be a staple in the diet. There are many philosophical and health reasons for not consuming modern meats, at least in large amounts. The main problem is that meat cultivated toDay is not like the wild animals on which our ancestors lived. First, they used meat for feasts and special occasions, not as a main food. Also, the free-ranging animals such as deer, moose, bison, and cattle had a much lower fat content than present-Day animals. They lived naturally only on vegetation and were not force-fed on lots of grains with less activity. These practices have greatly increased the fat content of animals from about 5 percent with only 2-3 percent saturated fats (cattle have slightly more) to the modern-Day levels of five or six times that. These extra amounts of fat in cultivated meats may make the difference, especially in a less active culture, between disease and health. The kids there are taught at early onset to “bring home the bacon”. They are quite good at it and there is no place to store it. Certain birds enjoy it. So glad that I don’t eat red meat any more.